Plant of the month. March 2014: Bleeding hearts – Glacier View Landscape and Design, Inc.
Spring has finally sprung and this month’s plant of the month is an early spring bloomer. ”Bleeding Hearts” or Dicentra is a genus that has 8 species of perennial plants. They are native to Eastern Asia and North America and will flourish from about zones 3 thru 9. Near Westminster and all along Colorado’s Front Range, they do well as long as they are planted with amended soil. They will not tolerate the heavy clay soils without amendments. They prefer part shade to full shade, though some afternoon full direct sun will not kill them off. They will also not tolerate the high heat of late summer here in Colorado and will go dormant in about August. Some Glacier View customers have called to say they died in August, but have been assured that next spring they will come up with the first warming of the soil. One should see them appear around March 1st here in Colorado. Appearing in early March with a fringed, ragged edged leaf, the foliage grows tall and fast on hollow tubed stalks, reaching 2-3 ft. in a few weeks. Foliage then takes on a softer, more rounded appearance, except the “Fringed” variety Dicentra Formosa ‘Luxuriant’, which instead displays fern-like, rugged edged leaves. 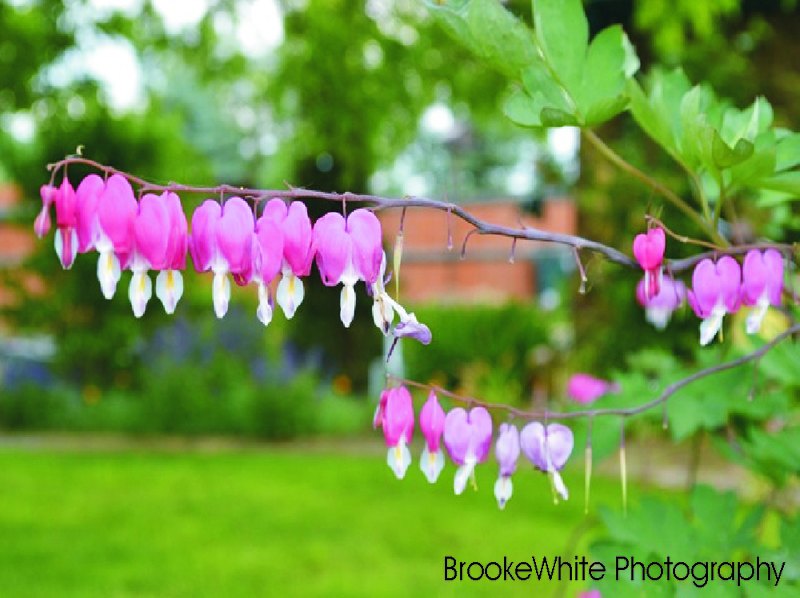 The stalks will droop with the appearance of heart shaped flowers colored deep pink. Dicentra (Lamprocapnos) spectabilis ‘Alba’ will produce pure white heart shaped flowers instead. The flowers stand out so well against the deep green foliage that the name Bleeding Hearts makes sense. Bleeding hearts are a great backdrop to the smaller varieties of Hosta, especially variegated Hosta, as both like the deep shade and their colors and textures complete each other. Plant in groups of three or in mass plantings as a backdrop to other lush shade lovers to really get that early season color to pop in your garden. They are best planted as more established plants in #1 size containers, and may be difficult to find in flats of 15 or 32. You can see examples of gardens installed by Glacier View on our Garden Designs page.